Telerik Watch Minute too short for your tastes? 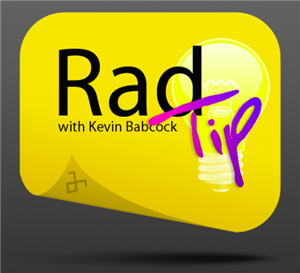 Then first, let me know, and then check-out our own Kevin Babcock's new video series called RadTips! In this series, Kevin will be creating 5 to 10 minute screencasts showing you how to accomplish specific tasks with the RadControls. The format is simple and condensed so that you see the essential steps required to use some of the cool RadControl features. For his first episode, Kevin shows you exactly what you need to do to use the RadGrid's new client-side data binding functionality (something I introduced you to in a recent TWM). In about 5 minutes, Kevin takes you from a blank page to working solution that is bound completely client-side. Future episodes will build on this example and show you how to add paging, filtering, and sorting your client-side operations. You can catch the video on Kevin's Telerik blog now. Hopefully you enjoy this new format. It's longer than a Telerik Watch Minute, it's shorter than a full-on Telerik Trainer episode, and hopefully just right for those looking for quick RadControl tips. Let us know what you think and enjoy the new video series! NOTE: Apologies in advance for the video quality. Not Kevin's fault at all. We're quickly working on bringing a very robust video CDN online so that we can deliver high quality videos around the world at incredible speeds. Stay tuned!